Although in recent years the Internet has grown rapidly in popularity as an information source, books continue as the main source of the history and writings of kamikaze pilots and other special attack force members. Especially in English, relatively little information exists on the Internet in comparison to many books published on the subject. Even though much more Internet information exists in Japanese than English, much information in published Japanese books cannot be found on the Internet. Also, many Japanese books about kamikaze continue to be published each year. This web site section contains critical reviews of English-language books published on kamikaze since the late 1950s. This section also has a few reviews of Japanese books, including manga (comics) and children's books. In the future, I plan to add reviews of other Japanese books on special attack forces. Personal Narratives - Provide readers with excellent insight into pilots' motivations, feelings, and opinions. Section includes reviews of 6 books written by former members of Japan's special attack forces. General - These books rely heavily on other published sources. This part includes reviews of books that cover a wide variety of topics related to special attack forces. Ship Histories - Accounts included in these books provide valuable sources of firsthand accounts by Navy crewmen who experienced Japanese kamikaze. Fiction - Critical reviews of novels about kamikaze or other special attack forces. These books have a wide variety of perspectives and approaches. Related Topics - Books with topics related to Japan's special attack forces. These books provide valuable background information even though they deal with other topics. Comics - Leave readers with distorted images of historical events and people. This part includes reviews of comic books with stories about kamikaze pilots. Japanese - Overview of Japanese books about special attack forces. Also includes manga (comics) and children's books. Lists - Various classifications of English-language books on Japan's special attack forces. 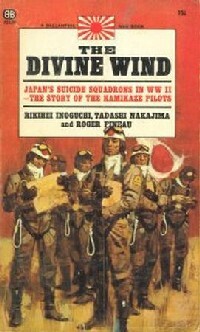 The most important primary English-language source of kamikaze history is The Divine Wind, a translation by Roger Pineau of the history written by two Naval officers present during the formation of the first kamikaze corps in October 1944 in the Philippines. This book by Rikihei Inoguchi and Tadashi Nakajima, first published in Japanese in 1951, provides many insights into the thinking of Japanese Naval leaders when they decided to initiate and promote kamikaze attacks. The U.S. Naval Institute published the first English translation in an article in 1953, and the full English-language book came out in 1958. The Divine Wind has become the most influential book, quoted frequently by other authors.